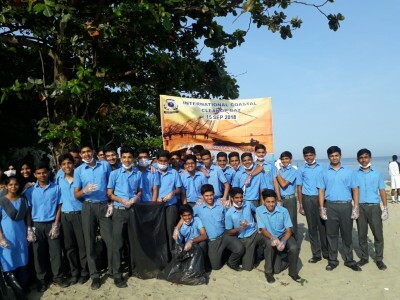 On 15th September, 34 students of Class XI represented The Delta Study for an event conducted by the Indian Coast Guard to celebrate International Coastal Cleanup Day. Students were accompanied by our counsellor Miss. Nidhi Ann Abraham to the beach, where clean up was going to take place. There were students from various schools in and around Fort Kochi. They were advised about the importance of cleaning the environment by the officers of Indian Coast Guard the CFF foundation of Fort Kochi and also by the city councillor Mrs. Shiny Mathew. After Half an hour students were provided with gloves and face mask. Then all present there set to clean the beach. Within one and a half students, teachers as well as many officers together come up with many bags filled with garbage. And then as a reward for the organizers served all present there with some snacks to Munch on certificates of appreciation were distributed to the students who helped in beach cleaning Campion.